If you walk along the Bow Road in London’s East End, maybe towards the new Westfield shopping centre in Stratford, you’ll come across a building that, even in its present neglected state, looks as if it has a story to tell – a story of a different age and values and a time of collective aspiration. 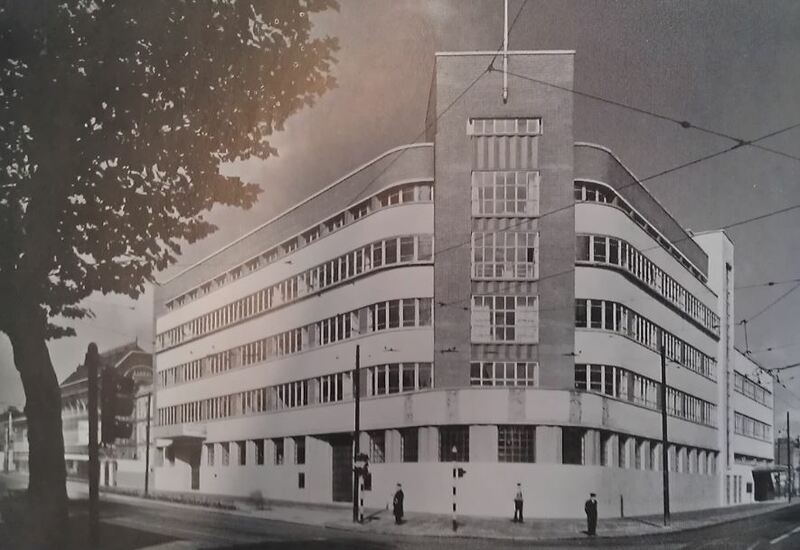 This is the new Poplar Town Hall, officially opened in December 1938. Poplar holds a hallowed place in Labour folklore as the venue of the Great Rates Revolt of 1921 when the Labour council refused to levy a cross-London precept on the rates in protest at the unfair burden that fell upon poor city boroughs. Thirty councillors – including the sainted George Lansbury and six women – went to prison. But ‘Poplarism’ won the day. 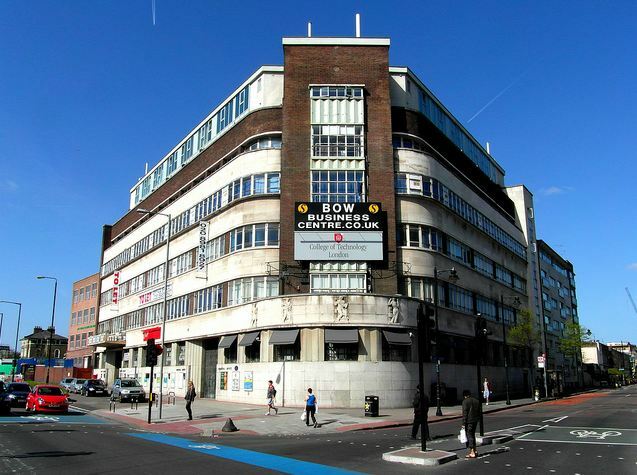 Today, the building is listed but beleaguered – its functions lost and not replaced when Poplar Metropolitan Borough Council was swallowed up by the new Tower Hamlets authority in 1965. But it retains its power to impress and a lingering echo of the ideals which inspired it. Poplar Town Hall (c) Reading Tom used under the Creative Commons licence. 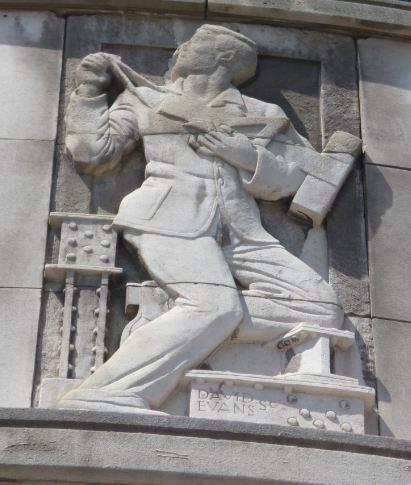 The sculptural panels shown below can be seen above the main entrance on the corner. The attic storey is a poor later addition. The building was funded by a loan from the Ministry of Health and London County Council (LCC) – on the grounds that a consolidation of services would aid efficiency – at a time of deep and long-lasting economic recession when contemporary sensibilities precluded any show of extravagance. 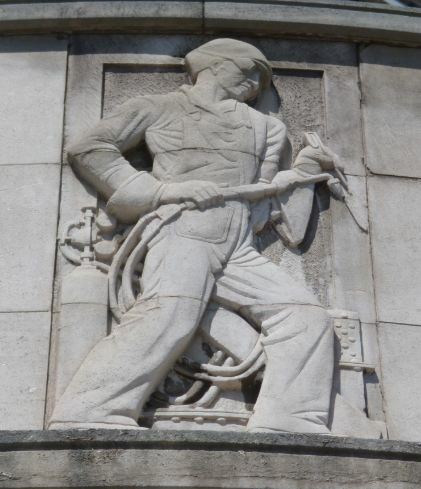 But if such was the necessity, it was necessity made virtue by Poplar’s Labour councillors. [If] the building were in reality a super factory transferred from Slough or the Great West Road … what of it? In so far as a factory was a place where worthily by the work of man’s head and hands the desires of his heart could be made living and fruitful that was what they wanted … this should have been a veritable palace of the people had not Poplar been so poor, but here it is, a worthy workshop for the worker’s welfare. An unconscious echo perhaps of Herbert Morrison’s remark of the same era in which he proclaimed the LCC a ‘machine [which] works with precision, good sense and humanity.’ Labour councils could not rest on their compassion but had also to convince a still sceptical electorate of their competence and professionalism. Municipal dreams were grounded in harsh realities and Labour’s exercise of power had to marry principle with practical politics. 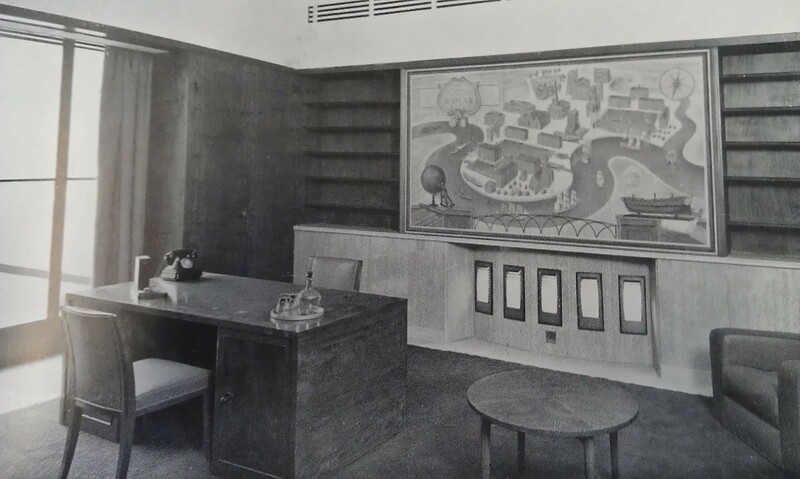 But the sweeping lines of the construction and the use made of its awkward corner site remain striking and care was taken to provide decorative features and interior fittings which were modern, functional and true to the Council’s mission. 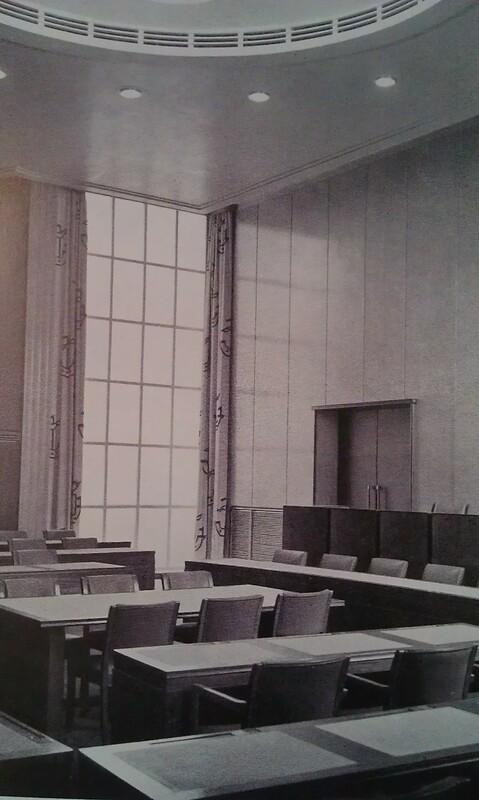 In the Civic Suite, ‘the Council Chamber, the heart of the Borough’ received ‘very special attention’ with its ‘flat floor with movable seating, walls flush panelled with Birdseye Maple, long, dignified windows and window curtains designed with sailing ships appropriate to Poplar.’ The Chamber was demolished in the 1990s. A mural in the Mayor’s Parlour (a room now altered beyond recognition with the mural supposedly placed in storage) represented the principal buildings of the borough. The Town Hall’s other principal element was an Assembly Hall with accommodation for 1,200. 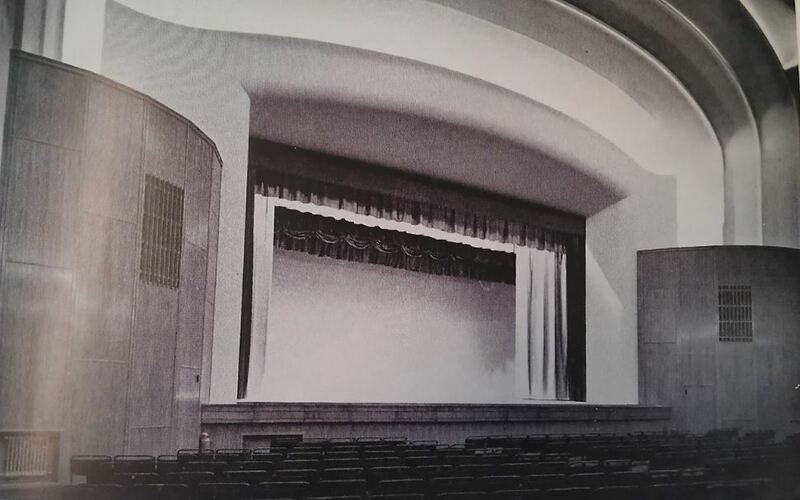 ‘Meetings, musical and dramatic performances, dances and future “talkies” [were] all provided for,’ states the programme – a reminder of how broadly it was intended that the building serve local people. This was demolished in the 1990s. 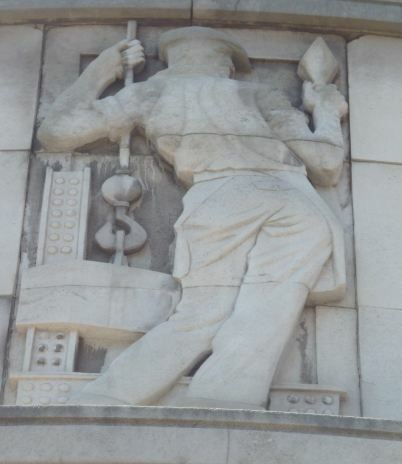 Externally, the outstanding features are the main entrance mosaic celebrating the borough’s docklands industry and five bas-relief panels, both the work of David Evans. 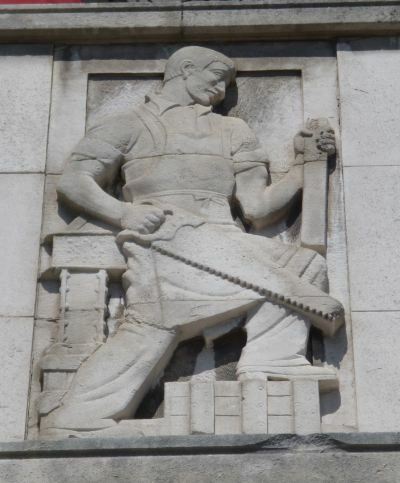 The panels depicted some of the tradesmen – apparently drawn from life in the first instance – engaged in the construction of the building: a carpenter, an engineer, a welder and two builders, all with the tools of their trade. The steel girders in the background reflect again the modernist ethos of the overall design. I believe that the future welfare of the common people is bound up with the development of a social conscience which will see not only in the work of high and mighty but in the labours of road menders and sweepers, social builders and engineers, miners and sailors. That is an aspiration which, for all the revolutionary social changes which have occurred since the bleak, class-ridden and poverty-struck days of the thirties, remains unfulfilled. George Lansbury, who performed the official opening of the new building, would have been disappointed. 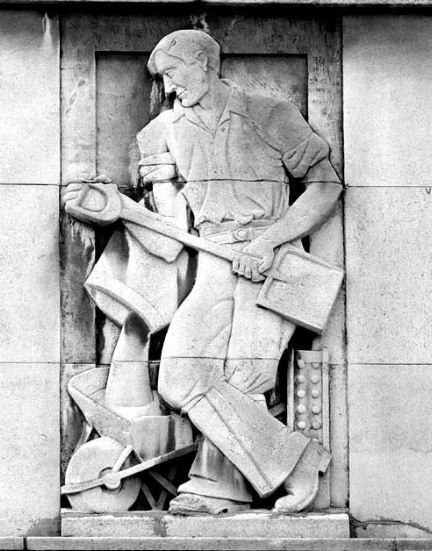 Metropolitan Borough of Poplar, Programme of the Ceremony of Opening the New Town Hall; British Listed Buildings, Former Poplar Town Hall (Bow House); Jeremy Haslam, Poplar Town Hall sculptures. 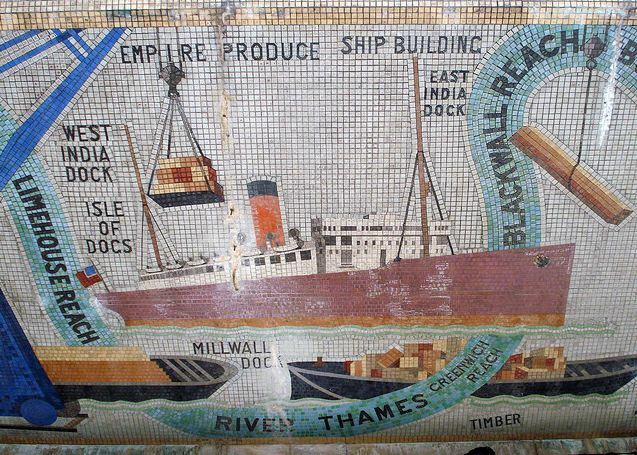 My thanks to Diamond Geezer (and his excellent Flickr site) for the Docklands mosaic image. Read his blog too.